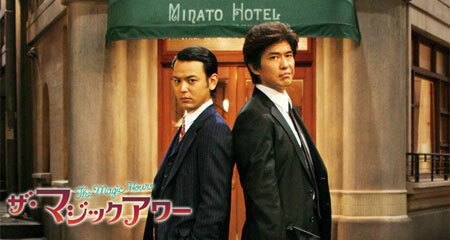 Satoshi Tsumabuki and Koichi Sato in The Magic Hour. The Skinny: A low-level gangster hires a lousy actor to impersonate a notorious hitman in this screwball comedy from Japan's modern master of the form, Koki Mitani. Thanks to Mitani's golden touch, plus a hilarious performance from Koichi Sato, The Magic Hour is an enjoyable and very funny time at the movies. by Kozo: Writer-director Koki Mitani has a knack for making classy commercial cinema. His Suite Dreams (a.k.a. The Unchouten Hotel) was a charming, if slightly labored farce that recalled classic Hollywood comedies, and it was as delightful as it was innocuous. Mitani improves upon his crowd-pleasing formula with The Magic Hour, which shows a love of cinema both in style and subject matter. Not only is the film a guileless screwball comedy like the work of Mitani's inspiration, the peerless Billy Wilder, but it features moviemaking as one of its themes. The film shows us that make-believe can be a worthy art, and does it in a manner that's more fun than it probably should be. Lives won't change, but The Magic Hour qualifies as one of the most enjoyable movies from any country this year. Satoshi Tsumabuki (Dororo) is gang member Bingo, who gets into hot water when he sleeps with showgirl Mari (Eri Fukatsu of the Bayside Shakedown movies), the girlfriend of his boss Teshio (Toshiyuki Nishida). Bingo gets fitted for cement shoes, but some timely name-dropping stays his execution. Bingo says that he knows notorious hitman Della Togashi, and if he can bring Togashi to Teshio, then he'll avoid a watery death. The problem: Bingo doesn't really know Togashi. He does, however, know that nobody knows what Togashi really looks like. Also, Bingo knows about Taiki Murata (Koichi Sato), a tough-looking and ridiculously earnest B-actor whose career has dwindled to walk-ons and stunt doubling. Nevertheless, Murata's love for acting keeps him hopeful, and Bingo takes advantage by pretending to be an indie film director with a script about a feared underworld figure named Della Togashi. After hiring Murata to be his Togashi, Bingo figures that one meeting will satisfy Teshio and get him off the hook. Bingo figured wrong. True to screwball comedy form, events spin wildly out of control. After their hilarious first meeting, Teshio decides to hire Murata/Togashi to aid him in an escalating turf war with rival gangster Jun (Teruyuki Kagawa). Also, Murata's agent Hasegawa (Fumiyo Kohinata) begins to get suspicious of Bingo and his self-described "indie film", and Teshio's top man Kurokawa (Susumu Terajima) also starts getting in the way. The most unpredictable factor, however, is Murata himself, who throws himself so fully into his role that nobody - Bingo, Teshio, and most especially the audience - knows what he'll do next. In the film's showiest role, Koichi Sato is winning and exceptionally funny, hamming it up as Togashi while earning tremendous sympathy when he's just plain 'ol Murata. Taiki Murata is a struggling actor who finds purpose while at his lowest professional point - a character type that is not new. But, in the hands of both Sato and Mitani, this previously-seen character feels fresh and funny. Mitani seems to be going for old-style entertainment here. There's darkness lurking at the corners of his screenplay, but he keeps things light and agreeable. The bad guys never seem that bad, and are willing to sacrifice everything to chase after dreams, or perhaps just women that they love. Likewise, material wealth takes a backseat to personal fulfillment, and people are always willing to recognize the effort and honor of others. The characters and situations are hardly plausible, but in Mitani's make-believe world, that doesn't matter. This is a film about simple values and a simpler time; the film takes place in the present day, but the setting is an old-style town made up to look like the early twentieth century. Characters dress in period garb, and they act like they're from that time, too. The Magic Hour is essentially a talky sitcom that possesses the wit and clever staging of an English stage play - except it's in Japanese and features close-ups that allow actors to emote silently. Some things are still best done in the movies.